Sanbo Sakaguchi earned a bachelor’s degree from UCLA in 1939 and then attended medical school at Marquette University in Wisconsin. During that time, his family in California was incarcerated along with nearly 120,000 other Japanese Americans on the West Coast during World War II. 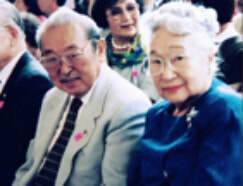 Upon his return to the Los Angeles area following the war, Sakaguchi married Kazuko (Kay) Furuta, whom he met after a chemistry class while he was a student at UCLA. He was then drafted on July 1953 since his status as an enemy alien was lifted and served in the army for two years. He furthered his skills as a bone surgeon while he was stationed at Madison General Hospital, Washington. He was promoted to Captain, U.S. Army while with the Army Medical Corp. returned to the San Fernando Valley in 1955. The couple maintained a strong connection to UCLA for the rest of their lives, remaining devoted fans of Bruin athletics and earning a spot on the Hall of Fame donor wall. In the 1990’s, he and his wife were instrumental in the establishing the Nikkei Bruins. The Sakaguchis were pillars of the Japanese American community, with his sister, also an UCLA alumna, Dr. Mary Sakaguchi Oda, practiced medicine for nearly 50 years. They have been acknowledged for delivering 3,000 babies in San Fernando. ​On January 27, 2012, the main hall of the San Fernando Valley Japanese American Community Center Nikkei Pioneer building was dedicated in honor of Sanbo Sakaguchi’s numerous contributions to society providing medical care at judo tournaments and Alemany High School football games, and much more. His journey is described in a book called, “Silent Scars of Healing Hands,” by Naomi Hirahara and Gwen Jensen. Dr. Sanbo Sukenobu Sakaguchi passed away on May 24, 2013. 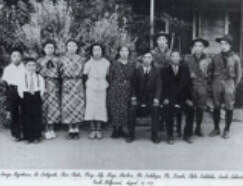 ​Left to right: George Hayakawa (close family friend), Bo Toshiyoshi, Chico Chieko, Mary Lily, Hisaji, Shiichiro, Obo Toshikazu, Mr. Kaneko, Chebo Toshitaku, Sanbo Sukenobu; Obo, Chebo, and Sanbo are in Eagle Scout (highest rank in the Boy Scouts) uniforms. Photo: The Sakaguchi Family, North Hollywood, California (August 10, 1935).